Something off the beaten path is already a step in the right direction for a newer act. All too often, bands aren’t willing to spread their wings until later on, once word has gotten around. 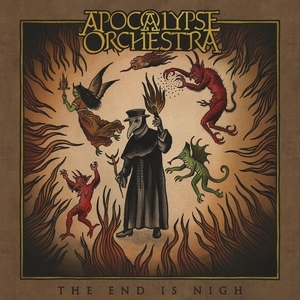 Swedish act Apocalypse Orchestra wear a number of different hats on their debut The End is Nigh, and it’s a breath of fresh air considering a number of the influences involved. That’s not to say that the band is some sort of smorgasbord effort, as you can get a pretty good idea from a few seconds of one song in what they are shooting for. The bleakness of doom metal combines with folk tendencies and a medieval flair (think Primordial meets Paradise Lost and My Dying Bride at a renaissance faire). Eloquent across the board, and ready to reel you in on the first listen. This isn’t happy and upbeat material – nor does it really ever start moving above the mid-tempo. It’s plodding, dark, and occasionally epic in scale – and yet you’ll find yourself seeking it out again and again. As the band name and title imply, this is music for the end and a fitting tribute as such. The folk instruments, such as the bagpipes, are an excellent fit and aid in designing the more medieval vibe that the band is going for. But there’s still a more modern, almost sludge-y feel at times, but it feels natural next to the rest of the folk instrumentation (see “Here Be Monsters”). A clear highlight is the vocals – mostly sung in a more unique mannerism, with some barks and chanting on occasion, and do a fair bit of pulling you in, despite the gloomy approach of the material. It’s clear that Apocalypse Orchestra have already figured out their sound and direction, and feel extraordinarily confident for a debut. The End is Nigh has a number of factors that could have caused it to crumble, but each component only strengthens the overall sound. Fans of folk, doom, and medieval music should be into this one – just don’t expect a celebration, this is more of a funeral procession.